Almost 600 homeless people died in England and Wales last year, according to official figures published for the first time. The figure represents a rise of 24% over five years, according to the Office for National Statistics. At The Wellspring charity for homeless and disadvantaged people in Stockport, staff and volunteers have created a mural in remembrance of those who have died. Chief executive Jonathan Billings says he personally knows nine homeless people who have died in the past year alone. He has worked there for 17 years and, while 10 years ago there might have been a few dozen people on the books, the numbers now run into hundreds - and more of them are dying. "Almost certainly, over the five or six years, it has become much more prevalent that people we are working with are passing away." Each death is shocking, he says, and there are a multitude of causes, ranging from murder and suicide to drug and alcohol overdoses. "Homelessness is just a symptom of something else. It is often a real concoction - a real mix of different issues that have caused that homelessness, and people's deaths are often a mix of different things, different factors," he says. Mark Urmston, who visited the centre for some lunch, says his brother Luke, 31, a rough sleeper, was found dead on a bench earlier this year after a suspected drugs overdose. They were in and out of care as children, he says, and both struggled with their mental health as adults. "Everyone in my family has mental health issues but I think his might have been worse," he says. "I think he was taking more drugs than he was letting on." He says his brother became homeless because of his drug use - but being homeless made it very difficult for him to get off the drugs. Ben Humberstone, head of health analysis at the Office of National Statistics, said: "What's striking about these figures is how different they are to the general population - 55% of the deaths of homeless people are related to drugs, suicide or alcohol, also known as the diseases of despair, compared to just 3% of deaths from these causes among the general population." The ONS says the deaths of homeless people were identified from death registration records, and statistical modelling was applied to estimate the most likely number of additional registrations not identified as homeless people. The definition of homelessness used by the ONS included rough sleepers and people in emergency accommodation such as night shelters or hostels. People in bed and breakfasts or sleeping on friends' floors or sofas were not counted. The ONS says these are experimental figures which means they are not yet fully developed and are still subject to testing - but it says the method provides "a robust but conservative estimate, so the real numbers may still be higher". Greg Beales, campaign director at Shelter, called the deaths a source of national shame, "a consequence of a housing system which fails too many people". Crisis chief executive Jon Sparkes called on the government to fix the root causes of homelessness, "like building the number of social homes we need and making sure our welfare system is there to support people when they fall on hard times". And Labour's shadow housing minister, Melanie Onn, called the figures shameful and said a Labour government would end rough sleeping within five years. Communities Secretary James Brokenshire responded: "No-one is meant to spend their lives on the streets or without a home to call their own. Every death on our streets is too many and it is simply unacceptable to see lives cut short this way." Mr Brokenshire said the government was committing £1.2bn to tackle homelessness, with £100m earmarked to halve rough sleeping by 2022 and end it by 2027. He added that councils were now required to provide early support for people at risk of having nowhere to live, "boosting access to affordable housing and making renting more secure". 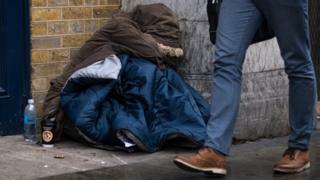 However, the Local Government Association, which represents councils in England and Wales, said this was becoming increasingly difficult as homelessness services faced a funding shortfall of £100m next year.